Entering stage left, Rêve Général arrive fully formed with a Euro spring in their step, offering the huddled masses a new take on a surprisingly well populated, if largely unnoticed forest track off the main drag of progressive music – chamber rock. The band is a coming together in musique cordial of two established acts in the European chamber/avant rock field, Volapük and Metamorphosis. Volapük drummer Guigou Chenevier was the catalyst, and the resulting conglomerate consists of three Frenchmen, two Czechs, two Austrians, and a native of Japan, and together they craft a wide-ranging avant but accessible sound taking in typical chamber rock stylings put through a distinctly rock blender. Dunaj for instance sounds like King Crimson played by a chamber string section overlaid with a heavy down-tuned guitar motif. That is the darker side of their muse, but elsewhere, as on the subtle yet menacing War, they draw in the listener with a lightness of touch, or go for a carefree Euro-folk dancing vibe on Vodka Express that mutates into a rock tour de force as the devil alcohol takes hold, ending with the swaying of a slightly inebriated bluesy bottleneck guitar. This album will not bore you at any point, and the shifting soundscape renders any lasting influence from other recognisable bands in this sometimes arid sphere obsolete. All the musicians listed are well known in RIO/avant circles, with Chenevier himself being a founder member of both Etron Fou Leloublan and Les Batterries. The album was recorded on stage at La Brise Glace, Annecy, in France, resulting in the sound being very alive and organic, mastered with his usual deft touch by Udi Koomran. The intricacy of the performance is evident from the start, the opening bars of Nějak entwining melody and counter melody, bowed and plucked strings from the cellos and violins weaving together to create a glittering web of sound that deconstructs to a form of chamber-psychedelia, enhanced by disembodied voices off. Occasional fully formed vocals feature, giving the likes of Paralyse the appearance of an atypical flirting with Zeuhl, its heavy beats and the near-operatic baritone of the vocal, low in the mix, combining in a recognisable fashion. Si tu Veux (If You Want), with its lyric reprinted in full on an inner panel of the tri-fold out CD sleeve, which features some neat surrealist artwork by Piero Coiffard (see front cover picture), stands out as a “song” in the traditional sense, but does not seem out of place. That despite it sounding at odds with the rest of the album, as it ventures into classy Gallic café jazz with east European touches, the song’s author Christoph Pajer musing on love “mais si tu veux, je fais, ce que tu veux et mes désirs n’important pas parce que je suis avec toi” (but if you want, I do what you want and desires do not matter because I’m with you). All quite charming! Following that is 5/4, penned by guitarist Martin Alaçam, an exercise in controlled tension, and in complete contrast yet once again, fitting right in. 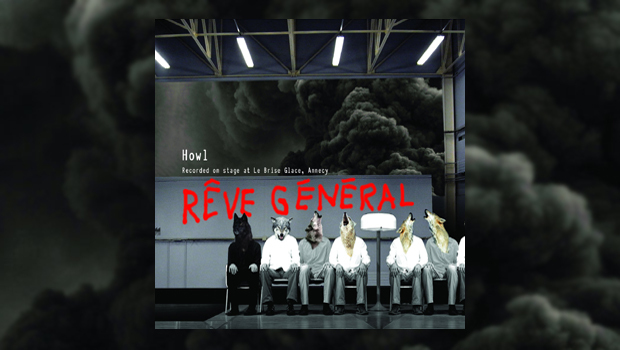 With seven different songwriters contributing individual songs, and the fact that Rêve Général is in effect two groups operating as one, it is no surprise that there are so many stylistic twists and turns, but somehow it all works, and the whole is more than the sum of the not insignificant parts. Howl lives up to the group name and has a surreal dream-like narrative, and there is no conclusion, or if there is it will make no sense once you wake up. This is a fantastic tour through what can be a rarefied place, but in the hands of Rêve Général it is anything but. Howl is fun, and the band has a sense of humour, exemplified by the track 11 being the tenth on the CD! Given that, I’m almost inclined to believe that the listed running time of “6:64” for the final track is deliberate. If you like adventurous music, you need this album.